Anchorage. Gambell Street and 5th Ave.
Airport Road. 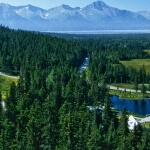 8 miles to International Airport, no access from New Seward Highway. You must turn west on Dimond or Tudor Road to Old Seward Highway, then take Airport Road to Anchorage International Airport. Tudor Road. Bypass route around Anchorage to Glenn Highway via Muldoon Road. Dimond Boulevard. Exit for Dimond Mall, Costco, Fred Meyers. O’Malley Road. To reach Alaska Zoo, turn east (southbound from Anchorage) and drive 2 miles. Old Seward Highway and Rabbit Creek Road. Parking for Wildlife Viewing Boardwalk and Rabbit Creek Rifle Range. Anchorage Coastal Wildlife Refuge (Potter Marsh), a 2,300-acre wetland for bird watching, interpretive displays along the boardwalk. Nesting ponds for Arctic tern, geese, ducks, and swans. Potter’s Marsh, parking. Great area for bird viewing. Potter Section House and Historic Park. Built in 1929 to maintain a section of the railroad, the house serves as Chugach State Park Visitor Center and railroad museum. Open daily 8 to 4:30 year round. Chugach State Park, north boundary. Parking areas are marked if they are safely accessible for Northbound or Southbound traffic. McHugh Creek State Picnic Area. Picnic sites, water, toilets and trails. The views of Turnagain Arm and Cook Inlet are breathtaking. Fast movement of the water (up to 6 knots) usually visible to naked eye. Fee area. Not recommended for larger RV’s. Access McHugh Creek trailhead. Beluga Point interpretive site with telescopes. Enjoy beautiful views of Turnagain Arm while you watch for beluga. Rainbow Road to Rainbow trailhead and parking, access to Old Johnson Trail. Scenic viewpoint, parking. Windy Corner Trail. Rest Area. Falls Creek trailhead. Bridge over Indian Creek, rest area at south end of bridge. Heavily fished by local residents. Sea-run Dolly Varden, silver salmon, rainbow-June to Sept. Pink salmon-July and August. Bridge over Bird Creek, parking, observation platform. Heavily fished by local residents. Bird Creek State Campground and Day Use Area. 24 sites with toilets, water. Handicap accessible. Fee area. Warning: The tidal mudflats that are exposed by low tide in this area are extremely dangerous, do not go out on them. There are many large scenic parking areas from mile 100 to the junction at Girdwood. Bird Point rest area. The historic gold rush settlement of Hope can be seen across Turnagain Arm. Junction to Girdwood and Alyeska Ski Resort. Tesoro 2 Go Tesoro gas and oil products convenience store.There is no fuel available between Girdwood and Seward on this Highway. There is a Bakery, Pizza and ice cream available in the complex behind the gas station. Glacier Creek. View of 3 glaciers to the east. Parking, Chugach National Forest, West Boundary. Parking at Twenty Mile River Observation platform with information on Twenty Mile River wetlands and wildlife. Bridge over Twenty Mile River which flows out of Twenty Mile Glacier. Parking. Portage/Whittier Information Center. Alaska Railroad loading for Spencer Glacier and Grandview. Portage Creek No. 2, parking. Come be a part of these exciting programs and watch these animals display their natural, “wild”, behavior. Coyotes peer out from behind the brush while a bald eagle swoops in on the salmon remains left by a grizzly bear. Wood Bison plod through 65 acres of tidal flat terrain, as part of a program that will one day restore the species to the Alaskan wilderness. AWCC has been able to provide care for hundreds of displaced animals because visitors to AWCC have made critical contributions in the form of admission fees, donations, memberships, and gift shop purchases. AWCC encourages you to visit the center with your walking shoes and camera in hand for an educational Alaskan experience to remember. 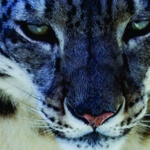 We thank you in advance for your support and assistance in preserving Alaskan wildlife. 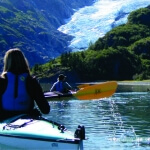 Portage Glacier Recreation Area – Access via a 5 mile/8 km paved highway. Three U.S. Forest Service campgrounds with more than 64 camping spaces are located approximately a mile apart on the Portage Glacier Road: Beaver Pond Campground, Black Bear Campground, and Williwaw Campground. The road ends at a large parking lot overlook at the western end of Portage Lake with excellent views of the icebergs floating in the lake. Begich Boggs Visitor Center – Open from Late May to mid September, 7 days a week. 907-783-2326. Forest Service Naturalists describe the many phenomena associated with the glacier. A self-guided trail begins south of the visitor center. During July and August you can see spawning salmon in nearby Portage Creek. 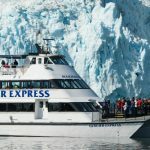 Portage Glacier is one of Alaska’s most accessible and frequently photographed glaciers. Icebergs, weighing many tons, are blown about on Portage Lake (600 ft. deep), creating an ever-changing panorama of weather-sculptured blue ice. 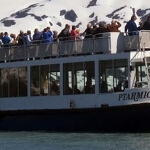 Whittier – The gateway to beautiful Prince William Sound, is only 63 miles from Anchorage. 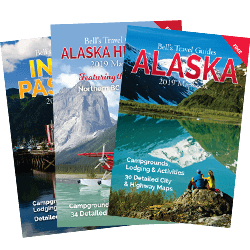 It is accessible by car, bus or via the Alaska Railroad. 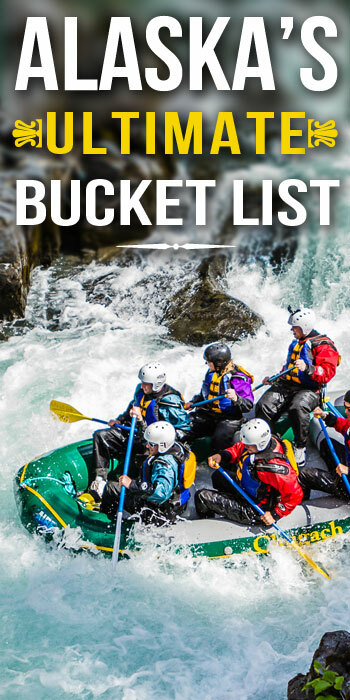 There are a number of great tours available in Whittier. Below are three we recommend.